U.S. Patent #8,660,898 issued in 2014. This P.O.P. Placement Program is our signature product for multi-site retailers and is used in thousands of McDonald's restaurant locations around the United States today. This program works by first creating full-color, realistic renderings of each individual location or site. 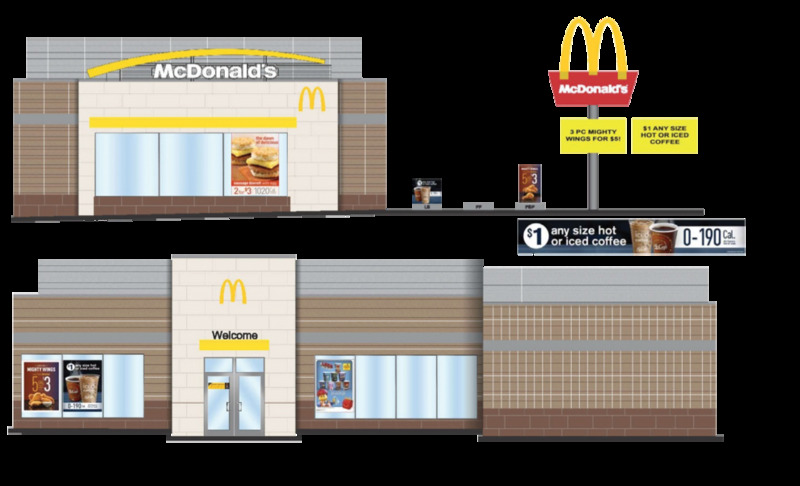 Based upon these full-color renderings, along with consumer traffic patterns that include both inside and outside the site, the program prioritizes the franchisors' P.O.P. merchandising elements. Our P.O.P. Placement Program include a comprehensive profile database. This profile database utilizes merchandising space not occupied by your national programs to uncover new merchandising homes and opportunities for local messaging. With this database, we are able to add important missing elements to your baseline profiles and create distribution lists for local promotions in order to provide you accurate quotes. It includes data for all products used (such as window wraps, readerboards, beverage bars, drive-thru toppers, etc.) in your retail or restaurant locations. Surveys allow markets to fully leverage your merchandising opportunities, as well as save you money on unnecessary P.O.P. elements. Data from conducted surveys are uploaded into the "cloud" and downloaded into our database. Our on-site surveys include: interior, exterior, drive-thru and street traffic analysis. We have surveyed more than 5,000 U.S. restaurants using our custom mobile-based program. Dramatically improves merchandising execution at every retail location. Maximizes the ROI of our client's P.O.P. investment. Reduces P.O.P. installation time by up to 20 minutes per location.